Chronic stress, tension, anxiety or physical overexertion can prevent restful sleep, negatively affecting health. 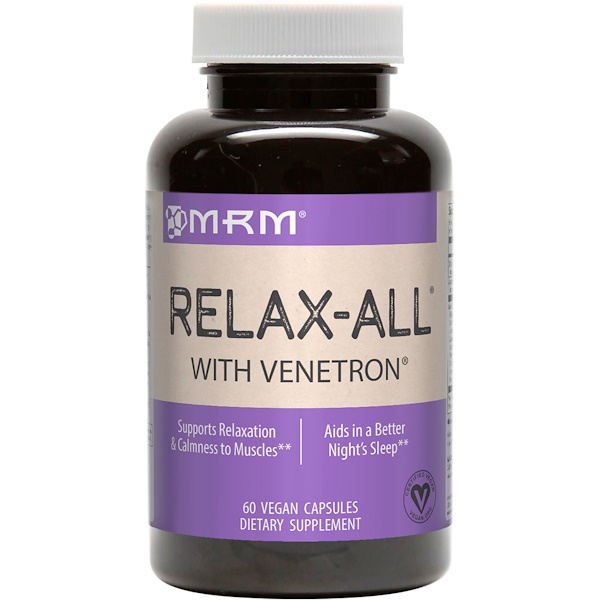 Relax-ALL is made with herbals, adaptogens and amino acids that allow the body to achieve a balance of muscle relaxation and mental tranquility. NeuralCalm contains Jujube, Valerian root, Ashwagandha, Chamomile and Lemon Balm, which all have long histories of use for relaxation. 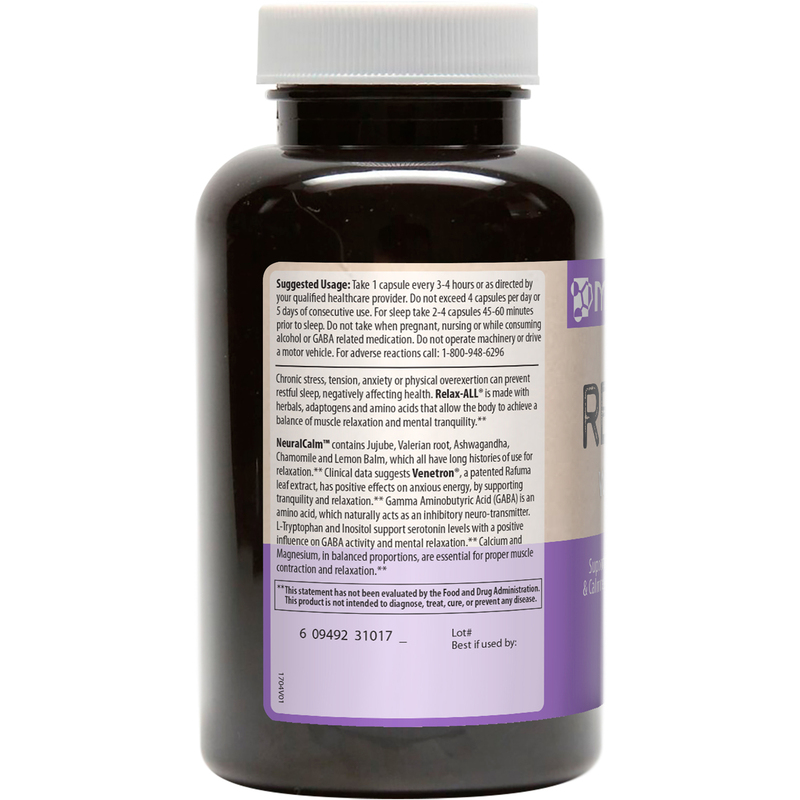 Clinical data suggests Venetron, a patented Rafuma leaf extract, has positive effects on anxious energy, by supporting tranquility and relaxation. Gamma Aminobutyric Acid (GABA) is an amino acid, which naturally acts as an inhibitory neuro-transmitter. 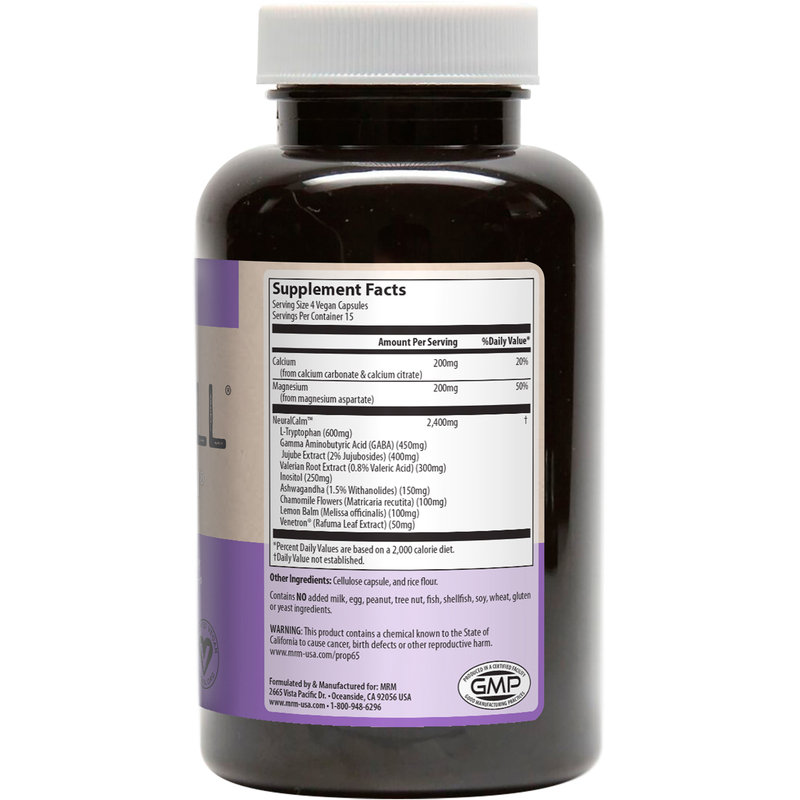 L-Tryptophan and Inositol support serotonin levels with a positive influence on GABA activity and mental relaxation. Calcium and Magnesium, in balanced proportions, are essential for proper muscle contraction and relaxation. Take 1 capsule every 3-4 hours or as directed by your qualified healthcare provider. Do not exceed 4 capsules per day or 5 days of consecutive use. For sleep take 2-4 capsules 45-60 minutes prior to sleep. Contains no added milk, egg, peanut, tree nuts, fish, shellfish, soy, wheat, gluten or yeast ingredients. Do not take when pregnant, nursing or while consuming alcohol or GABA related medication. Do not operate machinery or drive a motor vehicle.